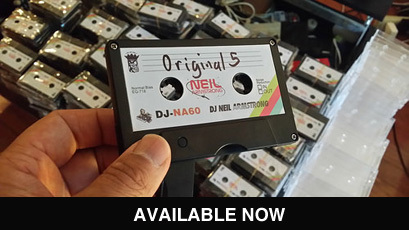 DJ Neil Armstrong DL Oscillate Wildly The 4th installment of the AOK (All Out King) Mixtape Series . This one is dedicated to the good music created by the synthesizer, and as is tradition, we're dropping a bunch of different genres melted together nicely with that Hip Hop Aesthetic you know and love - House, New Wave, Freestyle, Electro, and a good smathering of 80's to name a few. As always, I'm going to hit you with some unexpected twists & turns to try to make you scrunch your face up and say "ooh no he didn't..." Try before ya buy : <iframe width="100%" height="60" src="https://www.mixcloud.com/widget/iframe/?hide_cover=1&mini=1&feed=%2Fdjneilarmstrong%2Foscillate-wildly%2F" frameborder="0" ></iframe> AVAILABLE NOW AS A DIGITAL DOWNLOAD – $6.50, immediate secure download. Complete Mix in Mp3 Format, tracked out and sent as a Zip File.